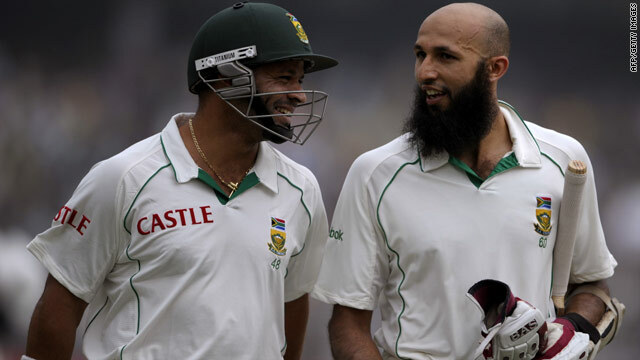 South Africa batsmen Ashwell Prince, left, and Hashim Amla have a big task ahead of them in the final day. (CNN) -- Rain on the fourth day gave South Africa hope of saving the second cricket Test against India and overtaking their hosts as the world's No. 1 team in the five-day game. The tourists reached 115-3 when play was halted early in Kolkata on Wednesday, still 232 runs short of making India bat for a second time with one day still to play. First-innings centurion Hashim Amla, a key figure as the Proteas took a 1-0 lead in the series in Nagpur, was unbeaten on 49 after India spinner Amit Mishra dismissed captain Graeme Smith and star all-rounder Jacques Kallis. Resuming on 6-0 after conceding a huge first-innings deficit of 347, openers Smith and Alviro Petersen struggled in a morning session cut by an hour due to wet conditions. Mishra trapped the left-handed Smith leg before wicket for 20 with the score at 36, and then fellow spinner Harbhajan Singh -- who shared the new ball with Zaheer Khan -- dismissed debutant Petersen for 21 just after lunch. Amla and Kallis added 57 before the latter edged Mishra to wicketkeeper Mahendra Singh Dhoni to be out for 20. That brought Ashwell Prince to the crease, reverted to his more familiar middle-order role after struggling as a makeshift opener in the series against England, but he faced only four balls before bad light stopped play half an hour before the tea break. Rain then fell again, and only one over was possible in the final session before play was finally called to a halt. Meanwhile, Bangladesh battled to 408 in reply to New Zealand's 553-7 declared on day three of the one-off Test in Hamilton. All-rounder Mahmudullah made his maiden century in scoring 115, while captain Shakib Al Hasan scored 87 as they put on 145 for the seventh wicket. Opener Tamim Iqbal had earlier fallen for a brisk 68 as the tourists slumped to 196-6 and looked like giving up a huge first-innings deficit. Opening bowler Chris Martin took three wickets for New Zealand, as did spinner Daniel Vettori, while Daryl Tuffey struck twice. The hosts reached 9-1 at stumps, with opener B.J. Watling run out by Al Hasan.